This fun and lovable dog breed is a powerhouse of energy. They're one of the most popular dog breeds out there and are renowned the world over due to their loyalty and playful attitudes. These dogs love to stay active, so it's important that they have the fuel they need to keep going. Golden Retrievers need to be supplied with a healthy diet to keep their bodies and minds in peak condition. Finding the perfect kibble for your canine companion can be a daunting a task. With hundreds of food options to choose from, you need to know what to look out for and what to avoid. How Much Food Do Golden Retrievers Need? These golden pooches are relatively large. Most adult Golden Retrievers can weigh around 70 pounds. This average weight varies based on their lifestyle and genetics. Female pups tend to be on the lower end of the spectrum while males can go beyond that average. With all that body mass, you can expect to feed your dog a significant amount of kibble each day. When you're measuring out your dog's food, it's imperative that you look at their food in calories rather than volume. The caloric value of food varies dramatically from manufacturer to manufacturer, so it's always a good idea to take a look at the label. Healthy adults will need around 1,500 calories to stay healthy. This amount is based on the average dog. Your furry friend's needs may vary slightly. Monitor their eating habits and activity level to find that perfect amount. If they're incredibly active, you may find that your Golden Retriever will require much more. Active working dogs can eat up to 2,300 calories a day. On the opposite side of the spectrum, you'll need to adjust this calorie amount if your dog's energy levels start to decline. This often occurs in old age, after an injury, or if your dog just doesn't like to run around as much. Senior dogs that are less active will usually do well on as little as 1,200 calories. 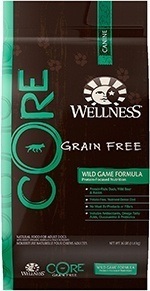 The grain-free dog food option from Wellness Core contains all the basics and nothing more. It's free of unnecessary fillers, chemical preservatives, and artificial colors. Instead of unhealthy extras, you'll find a slew of beneficial ingredients. Duck, lamb, turkey, and boar are combined as the protein source. They make up 34% of the entire formula. 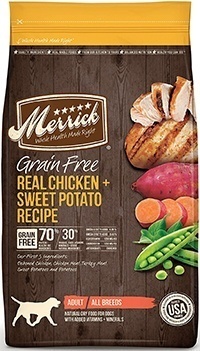 If you want to supply your dog with as much protein as possible, consider this formula from Merrick. About 70% of the recipe is made up of ingredients that are sourced from meat. The main protein sources are deboned chicken, chicken meal, turkey meal, and salmon meal. The food was designed with a dog's needs in mind. It has improved digestibility and contains no corn, wheat, or soy. There's also a healthy dose of omega fatty acids to keep your pup's golden fur vibrant. 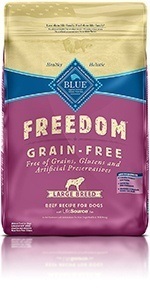 From Blue is this versatile kibble that's meant to support your dog's health throughout their entire lives. It's completely free of any grains that could potentially cause gastrointestinal discomfort. Instead, it's filled with high-quality ingredients. (Real meat) Deboned beef is used as the main protein. It also contains complex carbs like sweet potatoes and tapioca starch. The company's signature LifeSource Bits are also thrown in. These small morsels are made up of antioxidant-rich ingredients like blueberries and carrots. Some things you won't find are chemical preservatives or unhealthy byproducts. 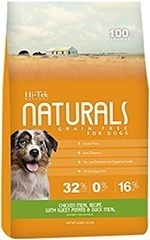 This dog food formula from Hi-Tek Naturals is designed to give your dog plenty of energy to play. It's completely grain-free and contains a bevy of beneficial ingredients. The main protein sources are chicken and duck meal. In total, it contains an impressive 32% protein. When it comes to carbs, this recipe contains many complex sources. It utilizes sweet potatoes as the main source. This inclusion of complex carbs makes the food a low-glycemic index option. Other great ingredients include tomatoes, flaxseed, and blueberries. 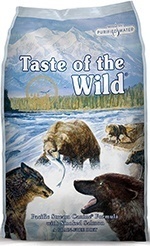 Taste of the Wild is a company that models their food offerings after the diet of a wild canine. This salmon formula is no different. It uses salmon, salmon meal, and ocean fish meal as the main source of protein. It's complemented with high-quality carbohydrate sources like peas, sweet potatoes, and garbanzo beans. While many dog food brands offer wet canned products, it's always best to supply your dog with dried food. Canned food can be great for dogs that are experiencing dental issues or whenever you want to add a boost of flavor to their standard food. However, Golden Retrievers should not have a diet that consists solely of wet food. Canned formulas aren't as nutritionally dense as their dry counterparts. They can contain upwards of 75% water and contain only a fraction of the calories as dry food. With the number of calories they need every day, you'll be spending a fortune just to meet their dietary requirements. Not only that, but dry kibble is great for your dog's teeth. The unique texture can help to keep the plaque at bay so that their pearly whites stay clean. Feeding your dog the right meal involves much more than just counting calories. You need to pay attention to the types of ingredients a formula has. 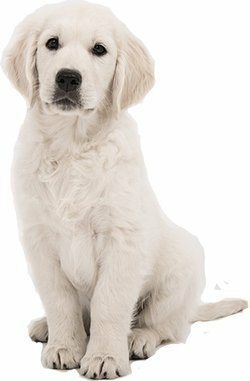 Golden Retrievers have very similar dietary requirements to other breeds of their size. With their high levels of energy, you'll want to make sure that they're getting all of the basics in. Protein is the most important nutrient your dog needs to thrive. Dogs are carnivores and will gobble up any meat that's put in front of them. A high-quality protein source should be the first thing that's listed on the ingredients list. Look out for lean meat sources life chicken, bison, and fish. These types of ingredients will provide your pup with a complex array of amino acids. They'll help your dog keep their energy levels up and develop strong muscles throughout their lives. Cheaper foods may contain questionable protein sources. These include byproducts and other mystery meats. Formulas with unspecified protein sources should be avoided as much as possible. They're typically unwanted bits and pieces from a butcher and won't do much for your dog's overall health. Sometimes, these sources even come from roadkill and may contain harmful chemicals or bacteria. In total, your dog's diet should be made up of around 25% protein. More protein is always a good idea, so you should be on the lookout for high percentages. Other healthy sources besides meat include eggs and meat meals. These should be secondary sources, not the primary. Carbohydrates are an essential macronutrient that is responsible for providing your pup with energy. They're found in every dog food and are typically used as a filler. Like protein, there are good sources and bad sources. Good sources are referred to as complex carbohydrates. They can include sweet potatoes, beans, and a variety of vegetables. They're considered complex because they break down much slower than simple carbs. This slow process helps to give your dog energy throughout the day and avoid sugar crashes. The types of carbohydrates you want to avoid include corn and soy. These ingredients are used in low-end dog foods because they're cheap. Unfortunately, they won't do your dog any favors. Corn and soy are harder to digest and may cause an upset stomach. Fat isn't always a bad thing. In moderation, fat can be incredibly beneficial for your Golden Retriever. Not only does it enhance the taste to make food more appetizing, but it provides a boost of energy. Some fats, such as omega fatty acids, can even help to keep your dog's mane clean and clear. It will moisturize your dog's skin and hair follicles to ensure that their fur stays shiny. Healthy sources include natural animal fat, fish oil, and flaxseed oil. Avoid any unnecessary additions. The best type of fat will come from the protein source. Adults will do well with around 10% in their diet. A healthy mix of fruits and vegetables will give your dog all the vitamins and minerals they need to stay healthy. Dog food manufacturers will often include a unique array of sources. Ingredients like pumpkin, spinach, and apples are tasty additions that are chock full of the healthy stuff. Certain fruits like blueberries and bananas can provide your dog with antioxidants. They'll help to fight off free radicals and keep your pup's immune system in check. When you're looking for all of the positive ingredients in your dog food formula, there are a few other things to keep an eye out for. There are some ingredients that dogs just shouldn't eat. These additions may do more harm than good in the long run, so it's best to avoid them as much as possible. Your Golden Retriever shouldn't have any problem scarfing down a high-quality food. There's no need to have artificial ingredients. They can't see the color of the food and probably wouldn't care either way, so why have it? When it comes to flavoring, artificial additives can wreak havoc on their digestive tract. Natural fats will add all the flavor they need to enjoy their meal. Chemical preservatives are often used in lieu of natural alternatives because of the slightly lower price. These ingredients don't agree with your dog's body. Some have even been known to cause issues in humans or other animals, so why take the chance? Some common additives to avoid include BHA, Ethoxyquin, and Propylene glycol. Instead of the fake ingredients, look out for good natural preservatives like tocopherols. Golden Retrievers may experience a number of health issues. These are common to the breed and can affect the dog at any age. Some of the problems can be avoided or alleviated with a proper diet. Also referred to as Gastric Dilation and Volvus, bloat is a fatal condition that can affect any large dog. When bloat happens, your dog's stomach will twist and fold. It's often attributed to poor feeding methods. Dogs can experience the problem if they eat too much food in a short amount of time or exercise shortly after a meal. To avoid the problem, split up your pup's daily caloric intake into multiple small meals and don't let them play for at least 30 minutes after eating. Golden Retrievers are voracious eaters that are prone to gaining weight. For a large dog, weight gain can be a life-long issue. It's important to stay on top of your dog's weight and monitor their fitness levels. You should adjust their daily calories to maintain a healthy weight. Golden Retrievers can suffer from allergic reactions just like humans. In most cases, the culprit is in their food. Some of the most common allergens that plague the breed are corn and soy. Allergic reactions often make themselves known through red and itchy skin. These issues can be avoided by providing a high-quality food that's free of unhealthy fillers. What is the Best Dog Food for Poodles? What is the Best Dog Food for Older Dogs?